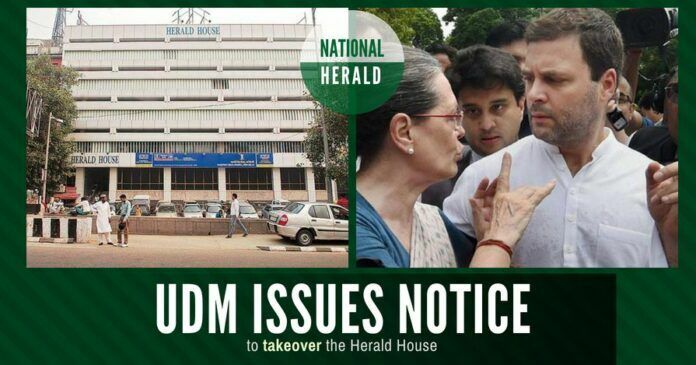 In a further confirmation of illegalities in the National Herald case, the Urban Development Ministry has issued a notice to take over the Herald House, the headquarters of Associated Journals Limited (AJL), publisher of the now-defunct National Herald newspaper. The notice was issued to the AJL, who got the land for publishing newspaper at subsidised rates. The Ministry’s action came after its probe team found that the Herald House and premises allotted in the Press Enclave in ITO, Delhi was not being used for the publication of a newspaper for the past 10 years, which is a violation of the allotment rules. Urban Development Ministry was acting on the complaint filed by the main petitioner and BJP leader Subramanian Swamy. For the past eight years, the holders of the building (literally the firm Young Indian (YI) controlled by Sonia Gandhi and Rahul Gandhi) were earning more than Rs.80 lakhs ($117,000) per month by renting out two floors of the building to Passport Seva Kendra. In the last week of December 2017, the Income Tax department has fined Rs.250 crores ($36.5 million) on Sonia Gandhi and Rahul Gandhi controlled firm Young Indian, which took over AJL in “covert and fraudulent” ways. A few months back, Delhi High Court had ordered YI to deposit Rs.10 crores for entertaining its appeal against the Income Tax fine order. According to highly placed sources in the Urban Development Ministry, two months back a probe team had inspected the premises of Herald House and found that no newspaper publishing activity was happening for the past 10 years. The plot for Herald House was allotted in the mid-50s at very subsidised rates for publication of newspaper by AJL like other media organisations in the Press Enclave Area. As per the lease agreement with the Government, AJL was expected to return the place as and when it stopped newspaper publication. In a similar way, prime lands were allotted for the publication of National Herald across the country. The lands were allotted at very cheap rates in Lucknow, Patna, Mumbai, Panchkula, Bhopal, Indore and all these land allotments are facing probes by various state governments. Urban Development Ministry was acting on the complaint filed by the main petitioner and BJP leader Subramanian Swamy. After Swamy’s expose, the Ministry has received several complaints of similar violations against many other buildings in the Press Enclave Area and probe teams would be asked to conduct investigation and details of the illegal holders of the premises in the garb of newspaper publication. In the trial court, the National Herald case is now during the process of submission of evidence by the petitioner Subramanian Swamy, who has started his deposition on July 21. The next hearing is scheduled for August 25. The accused Congress leaders also filed a petition in the court for restraining Swamy from tweeting about the case details and defaming them. VIP Cheats should be hung in public places. Income tax must move a petition to appropriate the rental income towards their IT dues!! Will Pgurus update us on the famous (?) son in law Robert Vadra’s cases? Why are proceedings so slow? Time to vacate 10, Janpath. Who in the CBI is protecting the Chidambarams?